A walk through a forest leads to the granite expanse on North Dome featuring exceptional views. The trail begins on an old road that drops down to Porcupine Creek, then levels out as it continues through a mature forest. Follow the signs for North Dome through a few junctions where the trail begins climbing up onto Indian Ridge. The trail gets steep right before you reach the top of the ridge where you encounter the junction with the Indian Rock Trail. Stay right to work your way out to North Dome. Before dropping down to North Dome, follow the spur trail for some exceptional views. 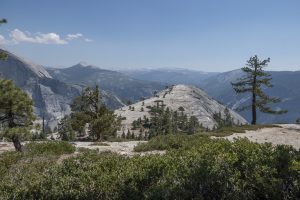 Return to the trail where you’ll drop further down the ridge and the views of Half Dome across Tenaya Canyon explode into view. The trail works its way through a few sections where you’ll need your hands to scramble down. You will then emerge from the trees and gently climb to the great views from atop the dome. While Yosemite Valley immediately below the dome is obscured due the curved nature of the dome, the views up and across Tenaya Canyon over to Illilouette Falls and out Yosemite Valley are great. The optional, short side trip up to Indian Rock Arch is well worth the effort. From the junction with Indian Rock, hike up another 0.2mi/0.3km to the only natural arch in Yosemite. Wonderful views looking north are available 0.5mi/0.9km beyond the arch at Indian Rock. Trailhead: Look for the signed parking area for Porcupine Creek on the south side of the road along the Tioga Road.